There’s all kinds of street art around Georgetown. Some of the art is obvious from the street and some requires a bit more investigation. There’s a great map you can pick up from most shops and restaurants that shows the location of many of the more famous examples of street art around the city. A copy of this map and two kids very excited to find paintings on the walls made for a great scavenger hunt for all of us! We found all kinds of interesting murals. 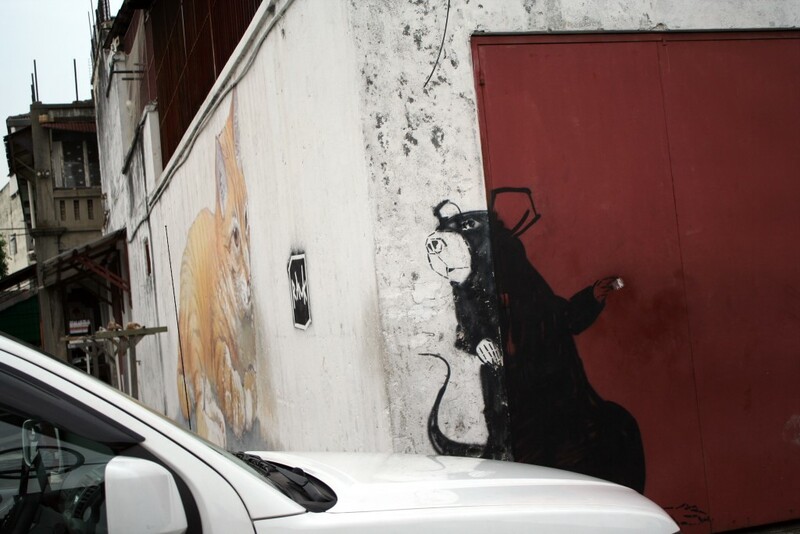 Animals are a common subject and one our favorites was a giant mouse hiding from a giant cat around the corner of a building. Some of the street art was even three dimensional, including bicycles, motorcycles, and other objects along with the paintings. We had a fun time posing for pictures with these 3D art pieces, often drawing a crowd eager to get their own photo of the twins with the street art. We also found several art installations that looked like line drawings, but are actually made of metal frames mounted just in front of the building walls. I think we had been walking around too long in the heat because I thought the first 2 or 3 that we saw were actually lines painted on the walls. 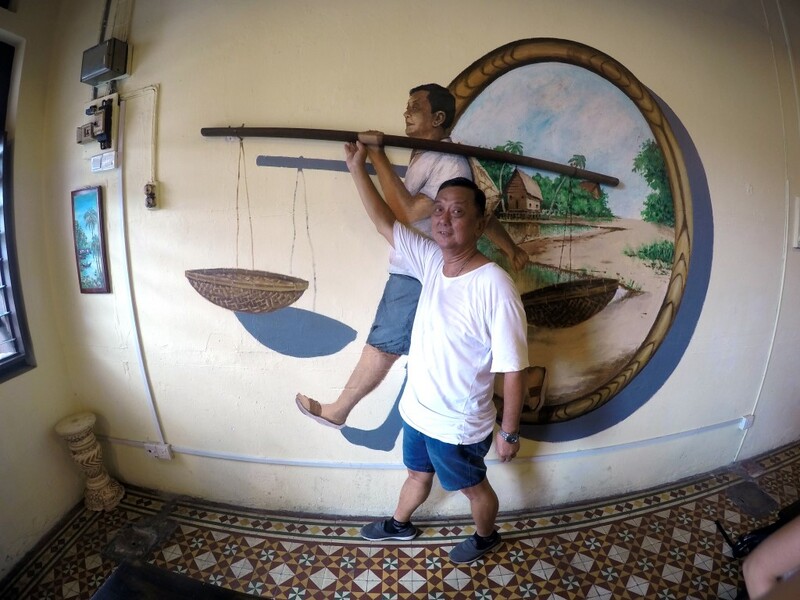 In between hunting for the street art we sampled some of the cuisine Georgetown is famous for. For lunch we stopped at My Own Café which we quickly learned had an extensive menu, offering anything you could want as long as it was asam laksa. 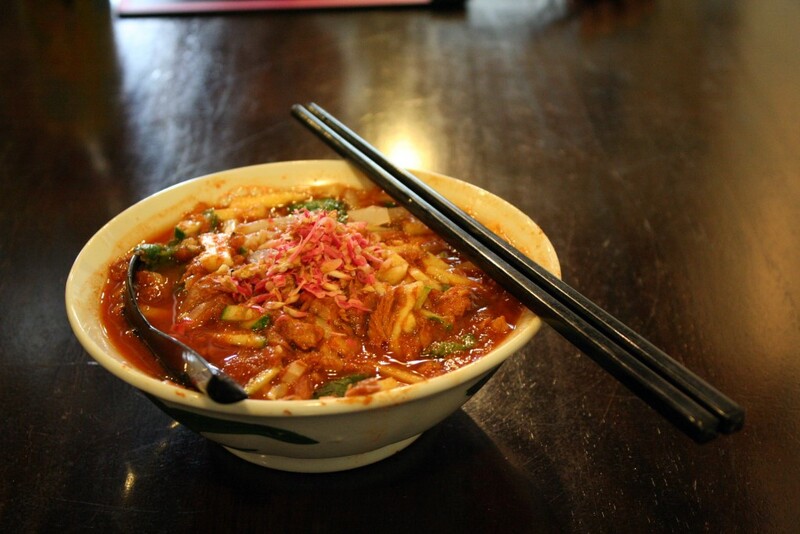 Asam laksa is a Georgetown specialty. It’s a noodle soup dish with a variety of spices, the most prominent of which is prawn (shrimp) paste. I gave it a shot and it was delicious. Kat and the kids ordered from a vegetarian restaurant across the street (our waiter at My Own Café actually took the order, went across the street, and then the food was delivered to our table). My Own Café even featured some street art on the wall. The funny part was the main subject was actually the proprietor. He was kind enough to pose and demonstrate! 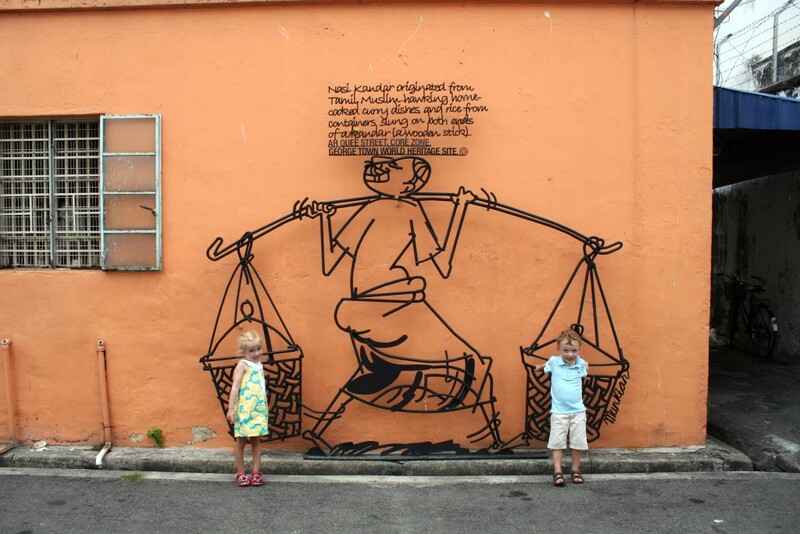 Looking for the Georgetown street art was a great activity with the kids. 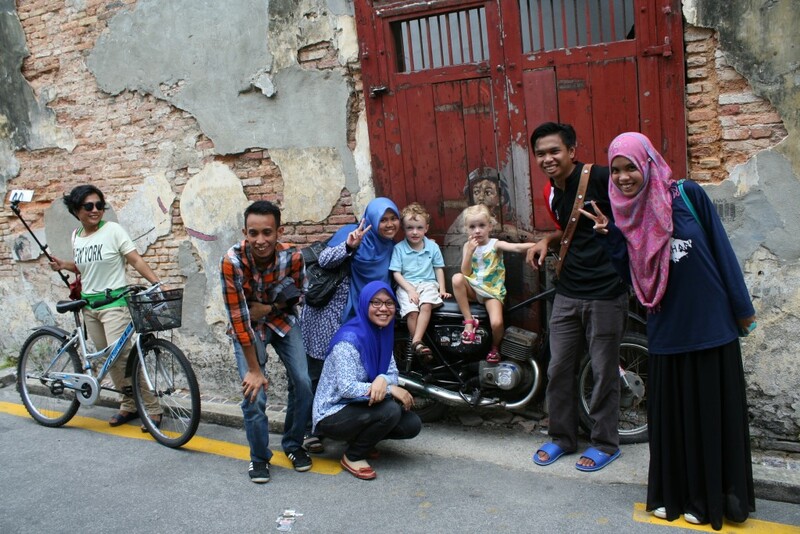 It’s free and it kept them engaged while we explored the city and enjoyed the architecture and atmosphere. I have really enjoyed viewing the street art. I didn’t realize that I should take you literally. Continued good fortune on your journey. Thanks Ilana! Glad you enjoyed the post.